An Australian native plant with scented flowers, Boronia ‘Purple Jared’ is a B.heterophylla X B. megastigma hybrid. Like all Boronias it will flower from late winter through to spring, and this one is a stunner with wonderful flowers. 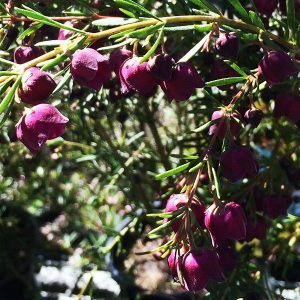 Deep purple in colour and with a strong fragrance, Boronia ‘Purple Jared’ make a great addition to any garden. ALso suited to growing in containers and excellent in a sensory garden. With a naturally dense growth habit, it will reach 1round 1.5 metres in height and spread to around 1 metre. A must for attracting bees and birds to the garden, as well as for the fragrance if provides on a warm spring day. Widely used as a cut flower, and this gives us a clue as to when to prune, during, or immediately after flowering. Simply prune back leaving some foliage on each stem. When planting, prepare the soil by digging over well, and ensuring that the drainage is good. A little added well rotted compost will be beneficial. Water in well with a liquid seaweed fertiliser and mulch around the plant. Position – Full sun with a little afternoon shade. Foliage – Mid to dark green and aromatic. Flowering period – Winter through spring.